American Pancake: Solar Estates - tender moments on "Shape"
Shape by Solar Estates is a dreamy indie rock affair filtered through a kind of shoe gaze meets alt country meets alt folk tones. It feels sweet and tender leaving the space to swell up with big soft crescendos of sound, droning synths and trancy guitar lines. The bass and drums anchor the song while keeping it moving rock steady as singer Aric Jeffries waxes poetic with a tender grounded vocal performance. 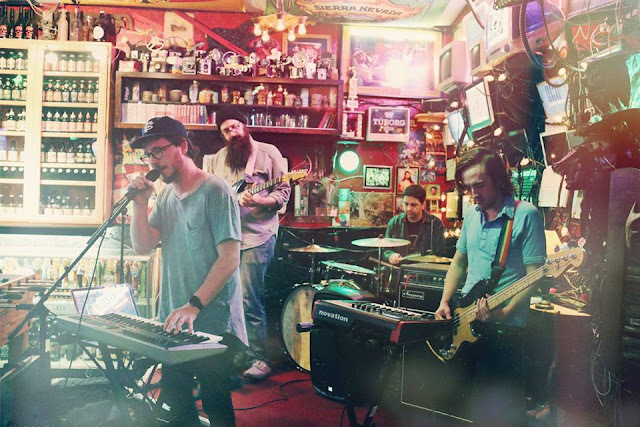 Solar Estates is a genre-bending indie band born out of the bustling and self-determining music scene in Chico, California. From shoegazing alt-country to atmospheric guitar pop, the band’s interest in genre is broad yet grounded in good songwriting and the prominent, frenetic styling of vocalist Aric Jeffries. Listen if you’re a fan of Hovvdy, Big Thief, boygenius, (Sandy) Alex G, The Hotelier, Sun Kil Moon, The Microphones, Slowdive, and Low.